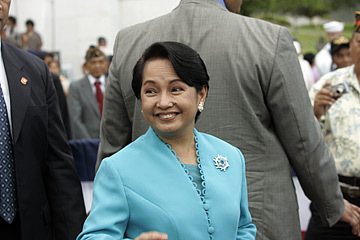 Arroyo turned to the crowd and smiled just before leaving the National Memorial Cemetery of the Pacific at Punchbowl. In meetings with elected officials from Hawaii yesterday, Philippine President Gloria Macapagal Arroyo discussed ways Hawaii and the Philippines could benefit from sharing information on alternative energy and making ethanol from sugar cane to reduce dependence on foreign oil. Arroyo noted in a brief talk to dinner guests that Hawaii and the Philippines could benefit from trading technology about ethanol, wave and wind power. Arroyo's speech last night was the last event of a whirlwind visit to Hawaii, which included the dedication of a statue at the Filipino Community Center in Waipahu yesterday afternoon to honor immigrants who came to Hawaii to work in sugar plantations 100 years ago. Arroyo was scheduled to leave early this morning for Manila. President Gloria Macapagal Arroyo arrived yesterday with her entourage at the Filipino Community Center in Waipahu. Arroyo met with U.S. Sens. Daniel Inouye and Daniel Akaka earlier in the day and discussed sharing information on growing sugar cane for ethanol, Inouye said. "We (in Hawaii) have some knowledge about planting sugar cane," Inouye said. Arroyo met with Gov. Linda Lingle before a state dinner reception last night at Washington Place. Ironically, just when the two were broaching the subject of alternative energy sources, the lights went out in the room where they were meeting, Lingle said in a speech before about 400 invited guests. U.S. Sen. Daniel Inouye spoke with Arroyo last night during a dinner at Washington Place. 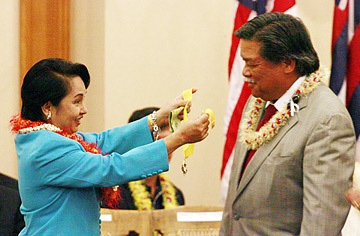 Wearing a black and gold floral print dress and an ilima lei, Arroyo presented Lingle with a presidential medal of honor for her role in the celebration of 100 years of immigration from the Philippines. Arroyo also gave former Gov. Ben Cayetano the same medal at the Filcom Center. The Filcom event honored the Filipino sakadas who came to Hawaii starting in 1906 to work on sugar plantations. Among the guests at the afternoon ceremony was Cirilo Sinfuego Sr., who said he earned just 46 cents an hour for cutting grass on a sugar plantation on Maui when he immigrated in 1946, leaving a wife and two young sons in the Philippines. Nineteen years later, when Sinfuego earned enough money to return for his family, "he could not even recognize me," said his son, Cirilo Sinfuego Jr. "I was already in college." 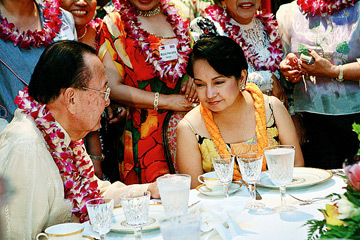 President Gloria Macapagal Arroyo presented former Hawaii Gov. Ben Cayetano with a Presidential Medal of Merit during her visit to the Filipino Community Center in Waipahu yesterday. 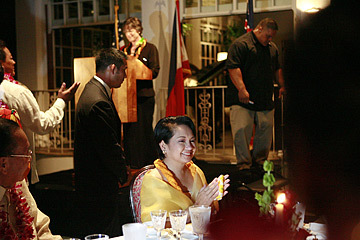 Arroyo praised Cayetano's accomplishment of being the first Filipino governor in the United States. "You don't have to be coming from a sakada family to know that we have to thank them for where we are right now," said state Rep. Felipe "Jun" Abinsay (D, Kalihi Kai-Kapalama). "Having her (Arroyo) here recognizes the significance of the sakadas." Though organizers said about 300 guests had been invited to the event, more than 600 filled the center's ballroom for Arroyo's appearance. In a short speech, Arroyo praised the contributions of Filipinos around the world to the fields of politics, public service, business, sports, arts, show business and culinary arts. 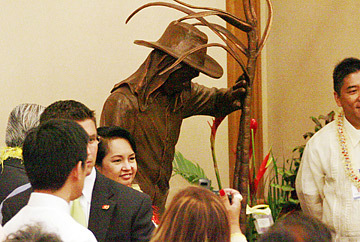 Above, Arroyo unveiled yesterday a sakada statue, similar to one dedicated by Gov. Linda Lingle in Port Salomague, Ilocos Sur, Philippines, in January. Arroyo described the first wave of Filipino immigration to America in 1906 as "the trailblazers who paved the way for the millions of Filipinos now residing in the United States." But, she said, "I long for the day when going abroad for a job is an option, not the only choice, for a Filipino worker." Waikele resident Brian Fujimoto brought his daughter Kristie, 5, and son Mark, 2, to get a glimpse of Arroyo's motorcade outside the Filcom Center, "because you don't see something like that too often," he said. Arroyo clapped after power was restored at Washington Place last night. The power went out shortly after President Arroyo arrived for a state dinner reception. Police and the Secret Service closed roads and freeway onramps from Kahala to Waipahu while Arroyo's motorcade passed yesterday. The closures caused some delays, but no major traffic problems were reported. Earlier in the day, Arroyo met with Honolulu Mayor Mufi Hannemann at the Kahala Resort and also received a briefing from Rear Adm. William Van Meter Alford Jr., the chief of staff of the Pacific Command, her press office said in a news release.